Importance of coconut for the body has been proven by all nutritionists, coconut contains a massive range of vitamins and minerals. 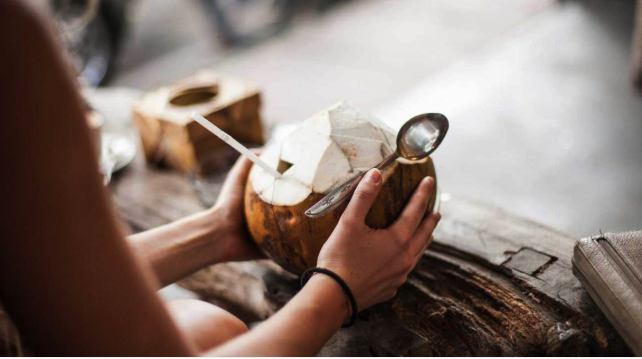 Coconut health benefits are contained in its milk, water, and oil and they are all endowed with an excellent cleansing effect. Fatty acids contained in coconut oil, greatly oppose ingestion of harmful bacteria and viruses into the body, building a kind of natural barrier. In particular, those who regularly include coconut oil in their diet should not be afraid of staphylococcal infection and thrush. Numerous studies have shown that those who eat coconut oil are less likely to have a feeling of hunger during the day. That is why it is recommended to add it to the morning smoothie or yogurt. Medium chain triglycerides, namely, they are found in large quantities in coconut oil, improve metabolism, and that contributes to weight loss and maintain a healthy metabolism in the body. Being a natural supplier of additional energy for the brain, ketones, which are positively affected by saturated fats from coconut oil, can significantly reduce Alzheimer’s symptoms. Saturated fats of coconut oil increase the so-called “good” cholesterol and suppress the “bad,” contributing to the improvement of blood circulation and significantly reducing the risk of cardiovascular diseases in the long term. Perhaps the most underrated beneficial feature of coconut oil is its pleasant aroma, which gives an entirely exceptional taste to many dishes. In particular, they can perfectly glaze shrimps, fish, and scallops. What is useful in coconut oil for hair? The latest trends in the hairdressing industry are natural coconut oil masks, which in a few days can easily add shine and fluffiness to hair. Try coconut oil as a moisturizer after a shower, unlike mineral oils, natural coconut oil does not irritate the skin and is completely safe for any skin type. Coconut oil benefits for skin are enjoyed by most Hollywood stars now. Cosmetics based on mineral oils are not recommended for use on particularly sensitive parts of the body, then coconut, on the contrary, will bring only positive results. This is especially true for the lips. Coconut oil can soften lips, and quickly cure nasty cracks, and protect from harmful UV rays. The same softening effect of coconut oil can be seen on dry cuticles. It is enough to cover them richly with coconut oil before the next manicure. Besides, it will strengthen the nail plate and moisturize the skin of the hands so that they will look much younger. All components of coconut today are successfully used in cosmetology. Especially useful are shampoos and masks for the treatment of damaged hair, based on coconut oil. It also applied in face masks that fight wrinkles, remove minor imperfections and skin defects, and fight acne. Coconut water is a natural isotonic (sports drink that helps the body to recover from prolonged exertion); therefore it is ideal for use during sports. It will help quench your thirst and rejuvenate your body. Also, this drink is recognized as the leader in the rate of replenishment of fluid in the body. Coconut water is used as a detox drink. It cleanses the body of toxins, heavy metals, and toxins. Coconut water has a high content of potassium: for 330 g of drink contains 620 mg of this microcell. Because of this, water improves metabolism, normalizes blood pressure and has a beneficial effect on the cardiovascular system. Many fans of the drink claim that coconut water prevents premature aging of the skin and improves its condition. Due to the cytokinins (a group of plant hormones that regulate cell growth, development, and aging) contained in it, the skin becomes elastic and radiant. Coconut water is a dietary product. Firstly, it does not contain gluten and fats, which will be interesting for those who like strict dieting. Secondly, calories index of water is only 18 calories per 100 grams, which is indeed more than in ordinary water, but much less than in any other isotonic. Coconut water speeds up the metabolic process, which is an invaluable quality for people who want to normalize their weight. Coconut water reduces appetite. It’s all about the taste of coconut water, which discourage the desire to enjoy any cake. So this drink is really perfect for losing weight. Doctors appreciate coconut water for its ability to stabilize blood sugar levels and stabilize thyroid glands. Also, the regular use of coconut water reduces the risk of seizures, kidney disease, and mental illness. Coconut water contains lauric acid, which helps to fight gastrointestinal infections and normalizes the work of the stomach. By the way, the same acid is included in B.reast milk, and some people believe that coconut water is suitable for artificial feeding of babies. Coconut milk lacks cholesterol, gluten, it is well digested and does not cause the accumulation of fat in the vessels. Therefore, the product can be used even with lactose intolerance, high level of cholesterol in body and deficiency of enzymes. The benefits of coconut milk can also be seen in combating different diseases of the respiratory system, especially – chronic. Coconut benefits are enormous. Coconut milk, water and oil have a good cleansing effect. Importance of coconut is exceptional for all people. Metabolism can return to normal, if you often replace some products – for example, butter, with products prepared from coconut pulp: the taste of coconut can reduce the feeling of hunger and reduce appetite. Coconut importance for health would be obvious if you use it regularly. Coconut milk, water and oil will not only strengthen the immunity, but will make you less susceptible to viral and fungal infections.